Cost to make your own recipes ratings & reviews site is less than $100. I recommend to create your online food recipe website like Allrecipes or MarthaStewart Food with Wordpress and Wordpress Theme – Food Recipes. WordPress is easy to install, easy to maintain and with a click of 2 buttons you can install and activate this Wordpress Theme to transform your blog into a professional and elegant Recipe Website. Food Recipes Wordpress Theme has a scrolling featured recipe slider, Ratings by forks, Average Ratings, visitors can rate the recipe, display most rated recipe, show recipe details such as cooking time, yields portion, course skill level and much more. Visitors can also login and submit their own recipes. Click here to see more features of Food Recipes. 1. $56 for Webhosting. To create your own Recipe Website, you will first need a domain name. That’s why I recommend Fatcow.com. When you purchase web hosting from Fatcow, you get a free domain name. Along with that you also get unlimited email, disk space, bandwidth, MySQL databases, host unlimited domains and more. Click here to immediately save 40% off at Fatcow.com. 3. 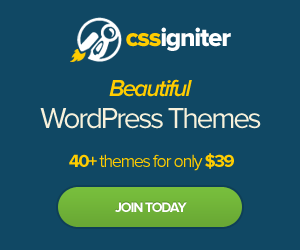 $45 for WordPress Theme. 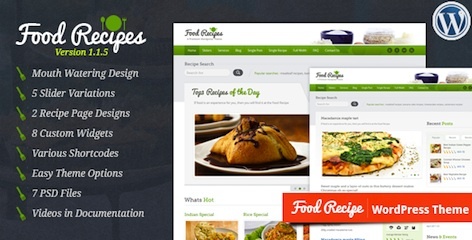 This is a one time fee to purchase Food Recipes WordPress Theme from Themeforest. After you download the theme, it totally belongs to you. There are no subscription fees, no membership fees and no hidden fees. 4. -$175 in Advertising Credits. If you purchase your webhosting from Fatcow.com you get free $175 worth of advertising credits. Fatcow.com understands it’s difficult to advertise your Recipe Site and so they give you free advertising credits, this includes $100 for Google Adwords, $50 Facebook ads, and $25 for Yahoo/Bing. So you actually don’t pay anything to startup your Recipe Website. 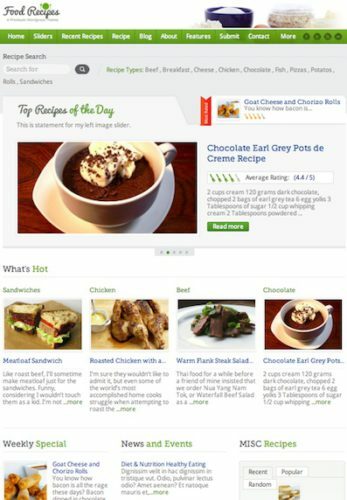 This is a great WordPress Theme to create a recipe website. I love the ratings by forks. It’s very cute. You can also see the average ratings (out of 5). Users can leave comments about the recipe as well. This recipe theme doesn’t leave anything about. You can add all the information about a recipe in the recipe details. The cooking time, prep time and even the nutrition info. I’ve never seen a recipe theme that has nutrition info before. The only thing is that this Recipe theme is not responsive. If users use their smartphone or tablet, the content will not auto wrap to the screen. They say that this feature is coming soon. I still think this is a great Recipe WordPress Theme for all it’s features.